For Molly McGuire, life is a carnival. This weekend, the locally-based artist and musician will bring her work to the 3-Ring Circus Big Top gallery for an installation entitled Splintered Personalities, which will run November 3-23. 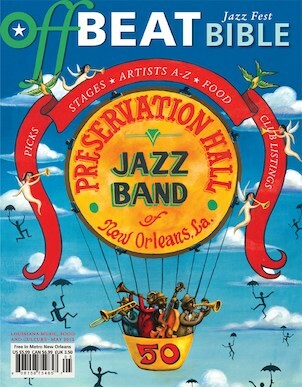 Artist Molly McGuire did the 2012 Jazz Fest Bible cover for OffBeat. Her latest show runs at 3-Ring Circus Nov. 3-26. As an performer with roots firmly grounded in the music community, McGuire has toured and played with bands for more than 20 years including Queens of the Stone Age, Frank Black, Yellow #5, The Spores, and Mondo Generator. 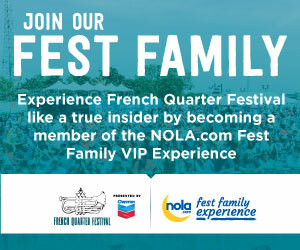 Despite a successful career as a musician in Los Angeles, she ultimately moved to New Orleans in 2008 to pursue her first passion – visual art. The gathering of her work into one cohesive exhibit has been a true labor of love, taking her around the city as she worked to assemble the installation. A 501© not-for-profit arts education organization, the 3-Ring Circus is located at 1638 Clio Street between St. Charles and Carondelet. Splintered Personalities, which opens Saturday, November 3 from 6 to 9 p.m., will run in the gallery through the 23rd with gallery hours from 2 to 6 p.m. Thursday through Saturday. Those interested in learning more about McGuire or the 3-Ring Circus are encouraged to visit their website.